Know more about who you know. 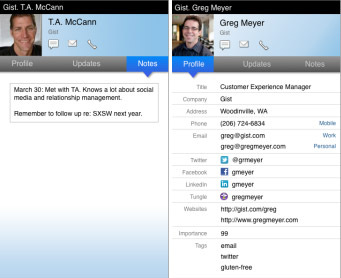 Gist for BlackBerry® smartphones enables you to access all of your contacts in one place and see updates for each contact from various sources including email, social networks and other online content. Gist combines all your contact sources and then collects contact details, news and social updates in one place to create an enhanced view into each person you know. Gist utilizes your email, social connections and contacts to build a network of your contacts and companies sorted by Importance. Gist reviews the volume of communication that you have with each and every person in your network, the frequency of communication and the number of account connections for each contact to establish an 'importance' ranking. Gist adds a 'Get the Gist' menu item to your BlackBerry's Messages, Calendar and Contacts applications. When you are viewing an item in one of those applications, you can select 'Get the Gist' from the menu to see the Gist profile of that person. Gist keeps you better-informed with less effort by giving you the right information at the right moment to help you prepare for a meeting, deliver an amazing pitch, or just find a better way to make a connection. - 'Get the Gist' for a contact directly from a message or calendar event by using the BlackBerry main menu. - See a photo for each contact and start a text message, email or phone conversation directly from Gist. - Read the latest news and status updates for your contacts and share information with your network. - Manage and view all your contacts in one place - use the “sort by Importance” option to highlight the people you're emailing and meeting with the most. - Add contacts to Gist from your BlackBerry Contacts, Google Apps, Facebook and Twitter. - Get news, status updates and contact details for everyone in your network. - See a unified contact list across email, social networks and other sources. - Use Search to navigate the contact list quickly, or sort the list by Name or Importance. - Easily share a social update or news item via email, Twitter or Facebook. -Support for sharing and chatting via BBM coming soon! - Your data is wholly owned and controlled by you. At no time is your data shared with other Gist users unless specifically granted by you. - Your data is secure. We take great lengths to secure all user data and ensure your data privacy and confidentiality. - The level of data integration that Gist performs is fully under your control. You can use Gist without including any existing accounts, or connect your email, calendar, contact and social network accounts for full integration. - We will never use your data to reach out to your contacts. Again, you are in full control. - At any time, you can give the command to wipe all your data from our systems.